Flores thinking he was on the trading block. Every Mets fan knows all too well feeling despondent, questioning the sanity of a commitment to a team that, when winning .500, it's a great day. There are the bright moments too, which is generally what keeps us tuned in, rather than contemplating which bridge to jump from. Ups, downs, it's all part of the life cycle of a season. But this week, catalyzed by the trade deadline on Friday, really surpassed it all, plumbing new emotional lows and highs. And in the end, it reinforced the richness that comes with fandom. Flores after hitting walk-off homer Friday night. Talk about an emotional wringer. The trade of Flores + Zack Wheeler for Carlos Gomez fell through, reportedly because the Mets medical staff doubted the health of CG's hip. Rumors flew during Wed's game, while Flores was on the field. He was overcome with emotion, wiping away tears, thinking about potentially leaving the team, the only organization for which he's played in his eight-year career. The fans cheered what they assumed was his last at-bat. No trade, false farewells. 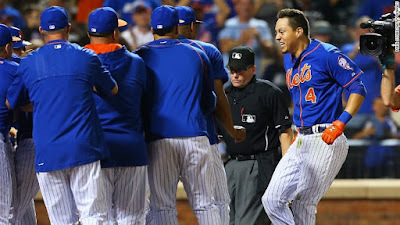 Collins gave him off Thursday (poor guy was probably exhausted), and he played last night in the nail-biter extra-inning game versus the Nats, driving in the winning run (and the only other Met run) and garnering ovations with each defensive play as well. It was the best and worst of times for Flores, but on the bright side, being named in a trade means you have great value. And it made fans appreciate a guy who comes off as a bit laconic, who has been somewhat undervalued all season, shuttling between second and short. Poor Zack. Not only is he recuperating from Tommy John surgery, he is getting batted around as trade bait like a shuttlecock. Honestly, he has never seemed to fit in well with New York, but he's a very good pitcher who would slot back into the new crack staff as a great 4th or 5th starter. So he was presumably at home (wherever that is) rehabbing, dangling in the wind. I read that he called Mets management to say that he wanted to stay a Met. Aww. After all the potential names flew—Tulowitzky foremost, aside from CarGo2, this was one I didn't hear. 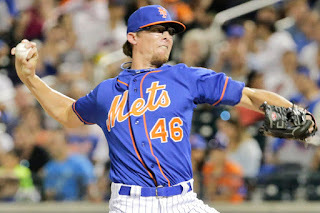 But he is supposedly excellent with the bat and defensively, immediately leading both within the team now. Alderson had to shut out all the rumors and criticisms all week and focus on sealing this deal, which sounds like a perfect fit. Like a unicorn, Wright showed up in the dugout this week, after his solitary exile in California, rehabbing his back. The first to high-five a hitter after a big hit, his energy has always been irreplaceable, even if he looked more like a coach than a player (presumably he will be a terrific manager when he hangs up his cleats). Talk of him playing a minor league game next week is almost too good to be true. Footage crept out of him doing "baseball activities." Hallelujah (with breath held). Getting Uribe, a competent third baseman, to me felt like admitting that Wright might not play this season. It seems more to be an insurance policy. Also, the guy is all in during his at-bats, and hit a homer in his first game. Plus, Clubhouse Presence. I don't even know what to say about his getting suspended for an entire season's worth of games for testing positive for PEDs not a month after returning to the team after serving a 50-game penalty. Can anyone be that stupid? Okay, the guy still looks more like an A than a Met—hair, weird glasses, his low body fat—but the idiotic situation of Mejia makes this acquisition all the better. 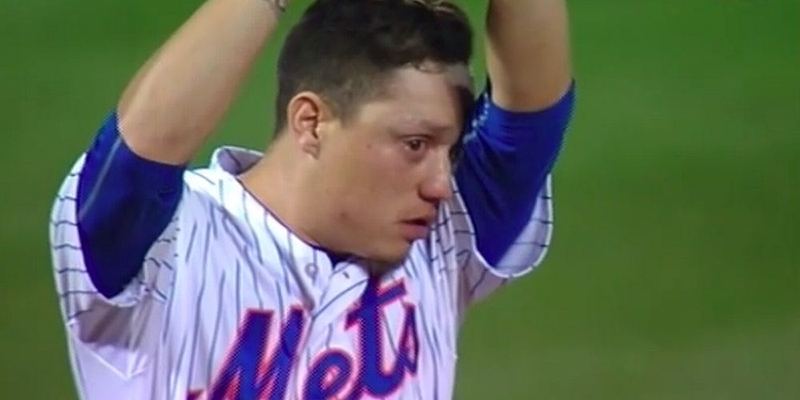 Also, Familia has been failing lately, whether from fatigue, under or overuse, or mental torture from his pal Mejia. Extra innings, blown saves after long rain delays. Walk-off wins. Not scoring any runs for long stretches. Then scoring a ton. Coming within one game of the Nats only to lose a few. Playing some of the best teams. Taking perfect games into late innings. You couldn't ask for more emotion packed into a week of baseball. It's been insane, but amazing. The amazin's! Now hang on for the second half of the season.